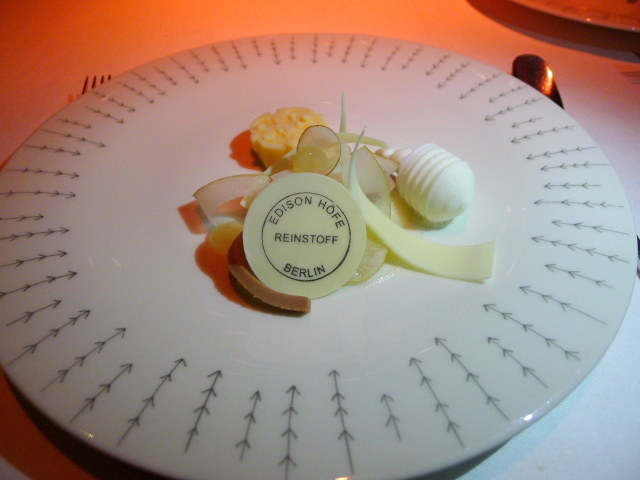 Reinstoff is a highly acclaimed two-Michelin starred restaurant located in the Mitte district of Berlin. The restaurant has also been bestowed with 18 Gault & Millau points with Head Chef Daniel Achilles holding the accolade of Gault & Millau Chef of the Year, 2014. Chef Achilles has trained with some highly acclaimed stars of the culinary world including the likes of three-Michelin-starred Juan Amador and Christian Bau. 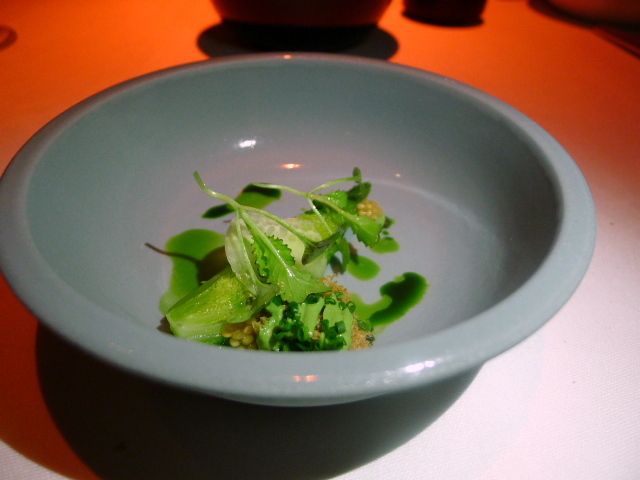 Victor’s Gourmet Restaurant by Christian Bau is one of my favourite restaurants of all time, and it was easy to see Bau’s influence of exactitude in Chef’s Achilles food as well. At Reinstoff the modern style of the food was executed with precision and can be best summed up by the name of the restaurant itself. In German rein means pure and stoff means matter. Reinstoff is housed in the historic Edison Courtyard and The Courtyard is so named as it was here that the first light bulbs in Germany were manufactured in 1883. Reinstoff has stayed true to the history of the building. The original brickwork has remained as has the tall glass windows. Also in view is the Prussian vaulted ceiling from which 240 silver glass balls hang to give Reinstoff an elegant effect. The Reinstoff menu consists of two degustation options, a ‘Quite Near’ menu which focuses on locally sourced ingredients, and a ‘Far Away’ menu which utilises ingredients more international in flavour (five courses – €100, six courses – €120, eight courses – €160). We went for the Far Away menu, but first to the canapés. A mustard ice cream with marinated walnuts providing an interesting contrast between the sharp flavour of the cold ice cream against the nuttiness of the walnut. Marinated trout with kohlrabi and a piece of crispy fish skin was slightly fishy in taste and it was therefore less appealing even though the skill with which it had been prepared was evident. We thought highly of the shrimp with its accompanying dried, intensely sweet red berries and wonderful horseradish cream, but the highlight was the mushrooms crisps with crunchy coffee for it was gloriously rich in flavour. The bread was a sourdough and it was superb. 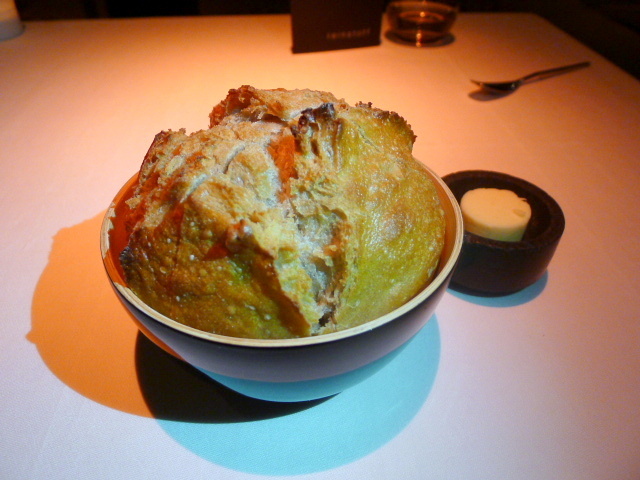 Served warm, the crust was crunchy and the centre was soft and flavoursome. 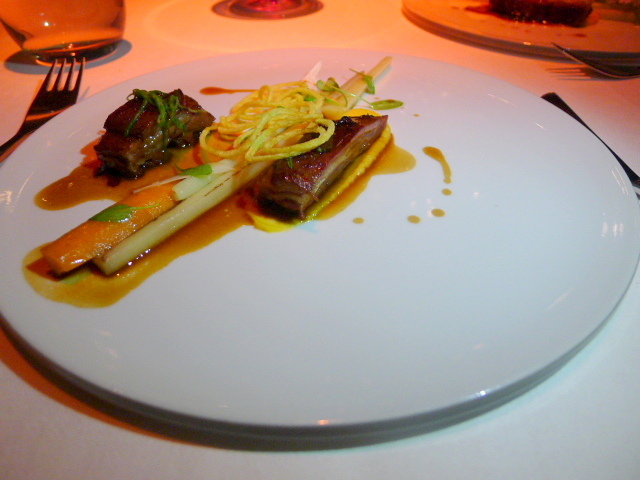 It was so good it was difficult to resist even though we were due to eat an eight-course meal. To refresh our palate before we embarked on our tasting menu was an amuse bouche salad of dill, cucumber, endive and mustard which was fresh, delicate and aromatic. The first course was an outstanding dish of Jerusalem artichoke tartare. 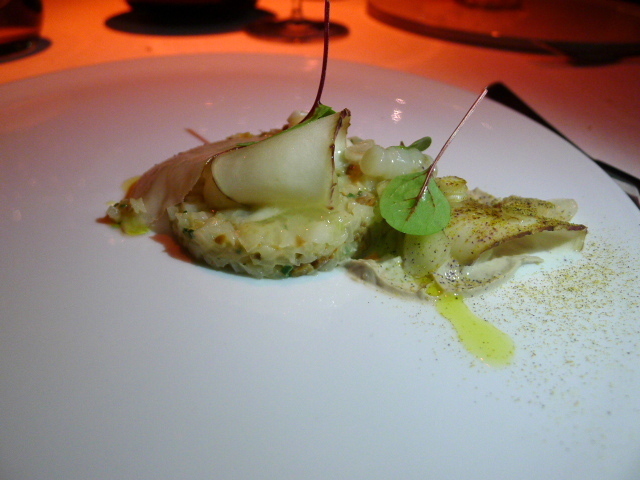 It was faultless with the artichoke being perfectly cut and perfectly cooked to yield the crunchiest of textures. Dressing the artichoke was a light and well balanced champagne vinaigrette with bergamot with bergamot gel acting as garnish. Pieces of soft cod had been beautifully cooked and were served with some tasty puntarella and a tangy pil pil emulsion made from a codfish reduction and grape seed oil. The texture of the pil pil was smooth and creamy if a little sharp. 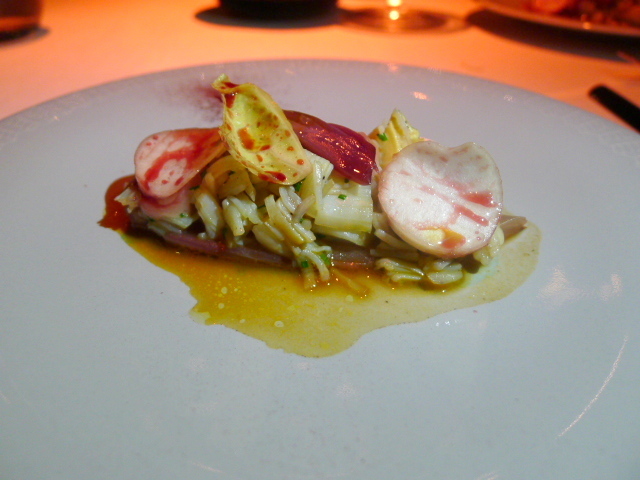 Oosterschelder crab was gloriously sweet and accompanied by some distinctive but slightly bitter chicory. Touches of hibiscus ran through the crab to elevate the dish with a touch of tanginess. 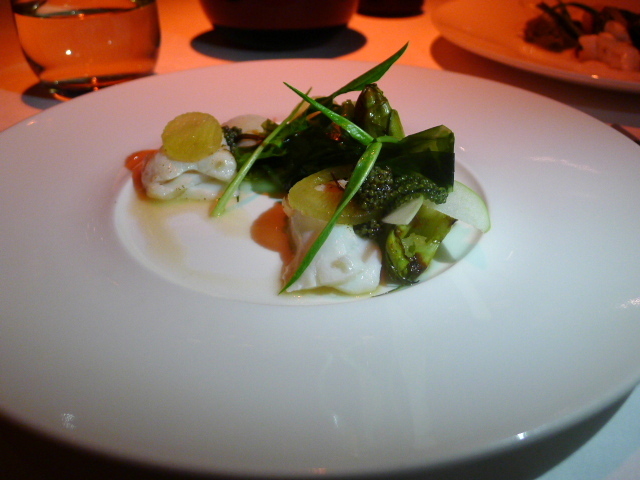 Pieces of flounder, gently cooked, was moist and intensely flavoursome. The sublime fish was served with sea buckthorn which complemented it splendidly by giving it an interesting and eclectic twist. 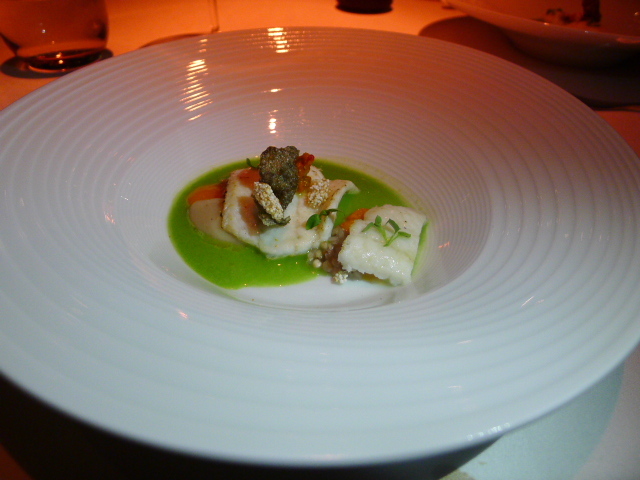 A chickweed sauce was earthy and complex and made for an accomplished enrichment to the fish. 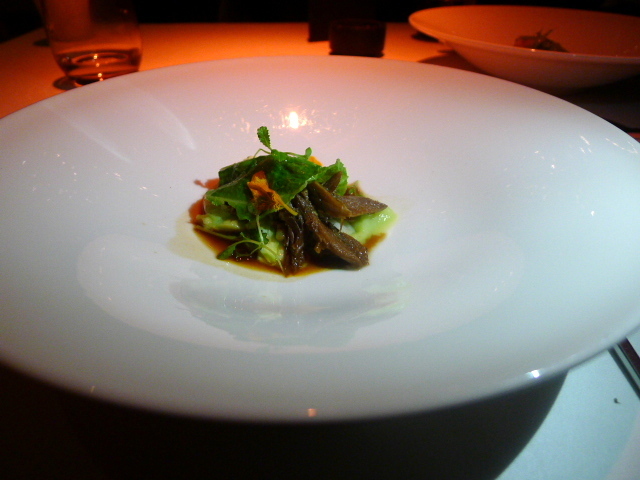 For garnish, there was some dried, then fried, crispy fish skin. 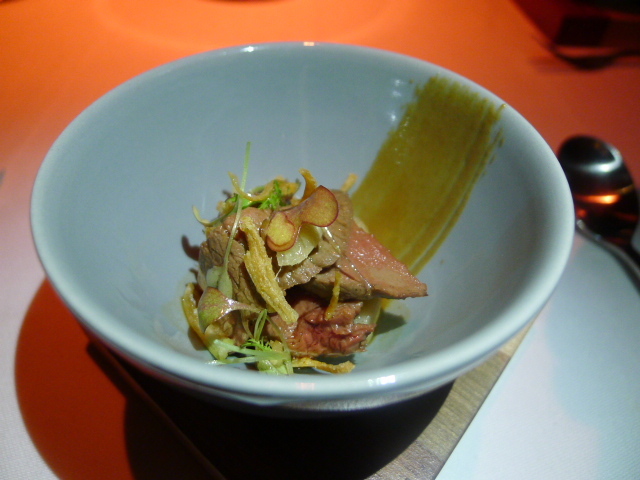 Confit of goose neck with gravy and winter cabbage was rustic and hearty, yet also elegant as it had been prepared with a lightness of touch. The goose was moist, tender and rich in taste, and the depth of the gravy added warmth to the goose. The meat course was venison served two ways, first of which was saddle cooked teriyaki style. The sauce was gracefully done, enriched with hints of sesame oil and roasted garlic. Acting as the base of the dish was some nutty, earthy lotus root, a classic Asian touch. The second serving was succulent venison ribs graced by a skilfully prepared traditional game jus flavoured with cedar and smoked oil. A perfectly cooked vegetable bundle of the season rounded off this faultless dish. 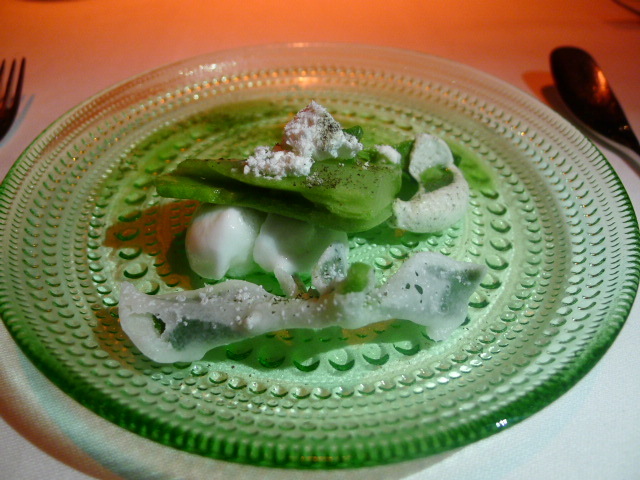 The refreshment/palate cleanser course was known as the ‘glacier ice plant’ with verbena and Moe vodka 1886. Ice plant, a plant native to South Africa, had been pureed and then set with gelatin and sugar to create an incredibly refreshing pre-dessert. It was mesmerising with its great show of originality. In a nod to the heritage of the location the dessert had been cleverly named ‘Edison light bulb’. It was glorious and consisted of shavings of sweet, ripe Williams Christ pears, pear ice cream, yoghurt ice cream and some seductive Jivara Lactée white chocolate. The contrast between the pears, chocolate and yoghurt worked to an incredible effect. 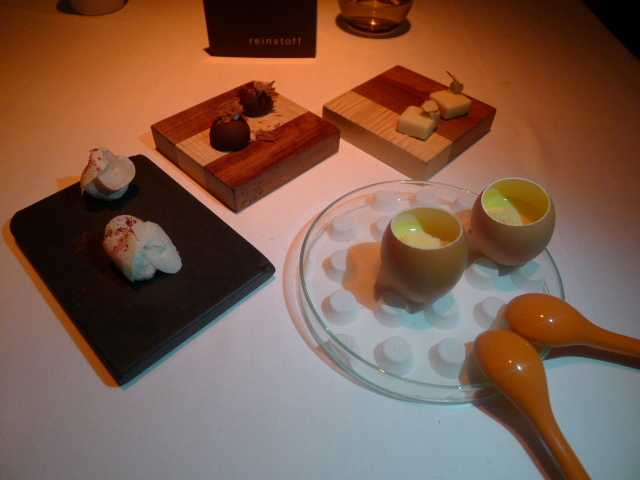 Petit fours consisted of some lovely marron glacé‎s, white chocolate with carrot that proved to be interesting and some delicate chocolates. The eggnog was divine for its creamy sophistication. It was easy to understand why Reinstoff has been bestowed with so many accolades. 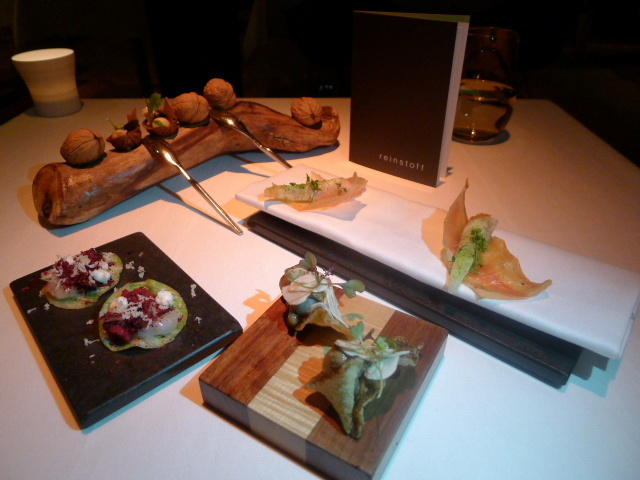 The meal was faultless and evident in the execution of each element of each course was a concentrated precision. The restrained elegance in the cooking was to be applauded and catered to palates that prefer unfussy refinement in their fine dining. The well-trained staff served to round off a complete dining experience.